The big question on everyone’s mind is when are they going to close sockeye? The river is closed, the commercial fisheries have been closed, but we are still open and the good news is it looks like we are going to be open for this weekend. There is a panel meeting today, and from there DFO will make their decision, but my sources have told me that it will be open this weekend and will likely close on Monday. I think they will make an announcement via email around 3:30 pm today (Friday, September 7th) that it will close on Sunday, September 9th at midnight. There will be some lobbying for it to stay open past Monday but I don’t think that will happen. Regardless, this low pressure system and rain this weekend s going to get most of the sockeye heading up the Fraser anyhow. I would expect fishing to slow down a lot next week even if it did remain open. There is also a new moon on Sunday and that means some big tides, so a lot of fish are going to head up the river on that big flood tide on Sunday. So if you haven’t had your fill yet, get out there as this is your last kick at the can! Fishing this past week was good to red-hot for sockeye. We found them in tighter as the fish are now starting to stack up closer to shore in 200-400 feet of water off the North Arm down to T-10 and pretty much all the way down to the South Arm. Some boats went right to the South Arm to start off and there were some very good reports. The wind made it pretty tough out there a few days mid week and that made it tough to go slow and make your turns with all those flashers down. On the days when the wind backed off we could stay on the schools in the morning and it resulted in triples and quads and easy limits. Good depths earlier in the day have been 70-90 and later in the day 90-120. Blue flashers are working well, as are green flashers. Pink Michael Baits with a glow head have been good producers and leaders in the 24-28 inch range have been working well. 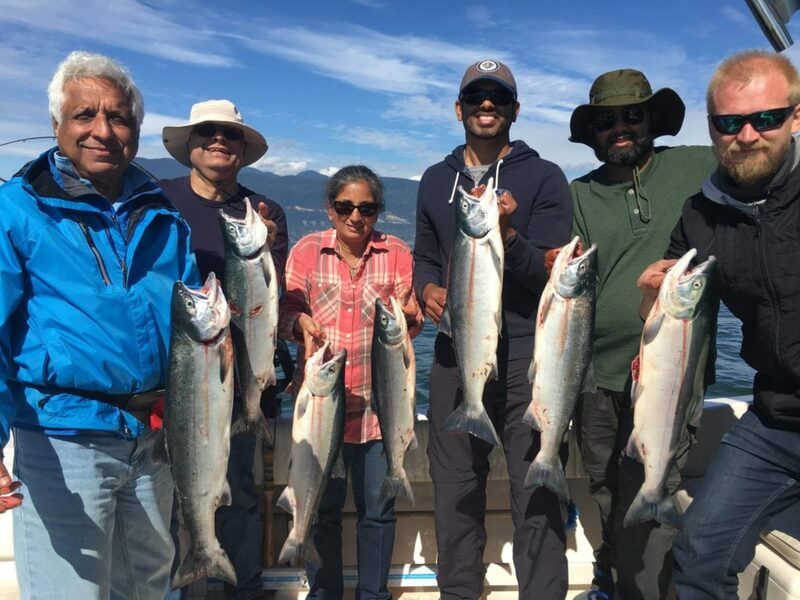 Some of our guests enjoying their catch at work! 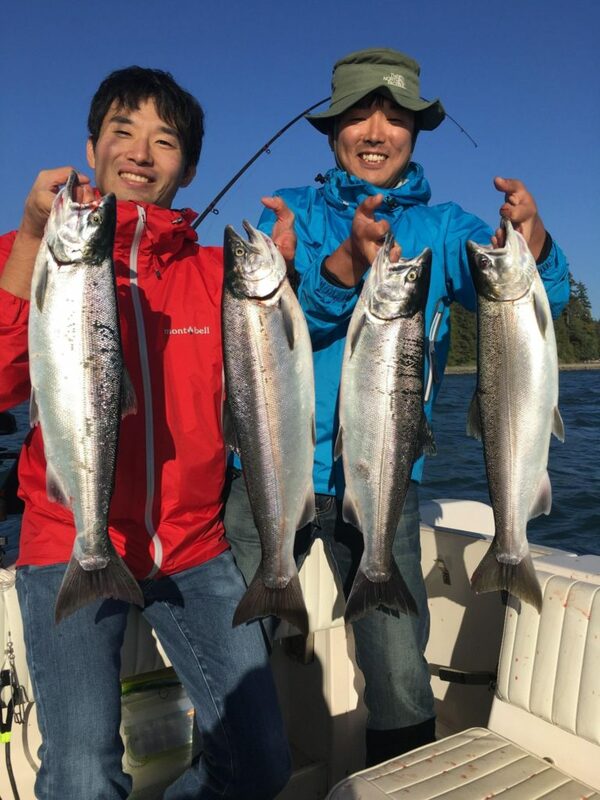 There was definitely a push of chinook this week as many of us hooked chinook on our sockeye gear midweek and those targeting chinook had some consistent action at the T-10 and South Arm. The white springs are rolling in and there have been some nice fish in the mid twenties caught. This week is usually a good week for the big whites as we get a concentrated push of white chinook heading up the Fraser. These are Harrison and Vedder/ Chilliwack fish for the most part and some will be heading to the Capilano. The forecast is below average this year for the Harrison and Chilliwack/Vedder runs, so I don’t expect it to be lights out like it was a few years back. These fish also don’t hold too long off the river, they show up ready to go and hit that fresh water and take off upstream. As a result the fishing is hot and cold and changes a lot each and every tide. If you are looking to target these fish, the same flashers and teaser heads we have been talking about these past 4 weeks are what to use and the depths are the same. These fish are generally about 25-65 feet down in the water so adjust your rigger depths accordingly. Bait is the name of the game so run anchovy or herring in Rhys Davis teaser heads. One of my hot chinook setups this year has been the Phantom flasher with the UV chartreuse blade and the green moon jelly tape. This with a glow green or glow chartreuse teaser head has been very productive. I have been doing well on my top rods with a Betsy flasher and UV green teaser head. Don’t be surprised if you hook some coho as well. 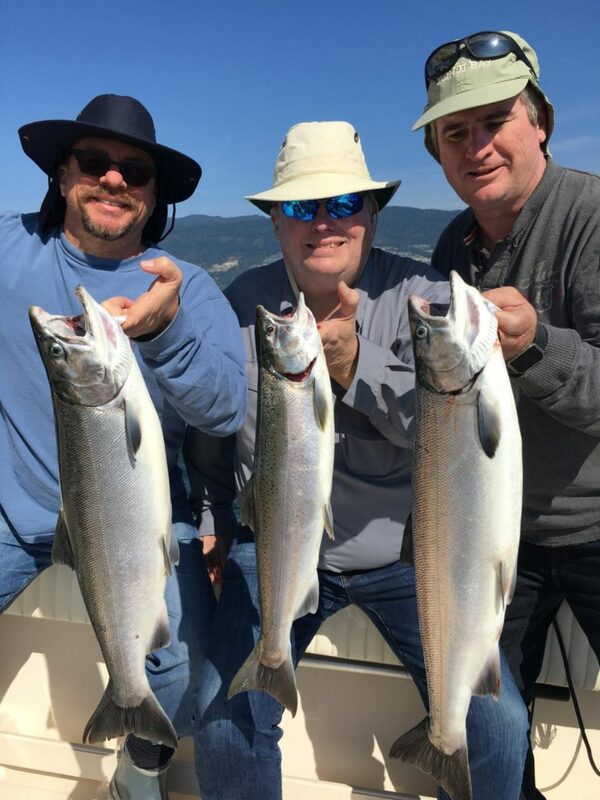 There has been a good number of coho encountered off the South Arm while chinook fishing and lots of hatchery fish that are likely heading to the Vedder/Chilliwack. Looks like the float fisherman and fly fisherman are going to enjoy a good coho run on the river this year if water conditions cooperate. Speaking of coho, there are still lots of coho around off the Cap Mouth as the river has been too low for them to go upstream. With the rain and big tides this weekend, I am sure some of them are going to make a go of it, so that could change the good coho fishing we have been enjoying. We haven’t hooked any chinook off the Cap Mouth yet, but that will change next week. 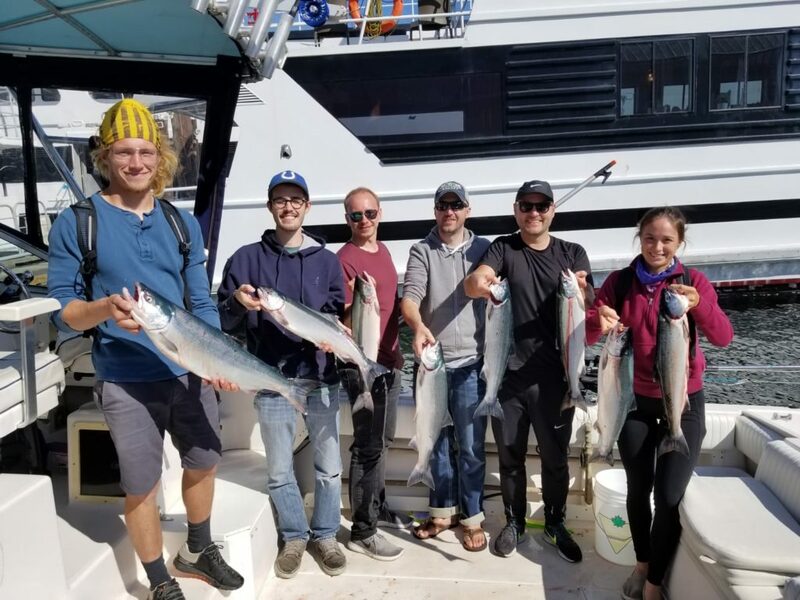 We have been chasing sockeye pretty much non-stop, except a few days of good coho fishing thrown in on our shorter trips or when it was too windy to get out of Vancouver Harbour. 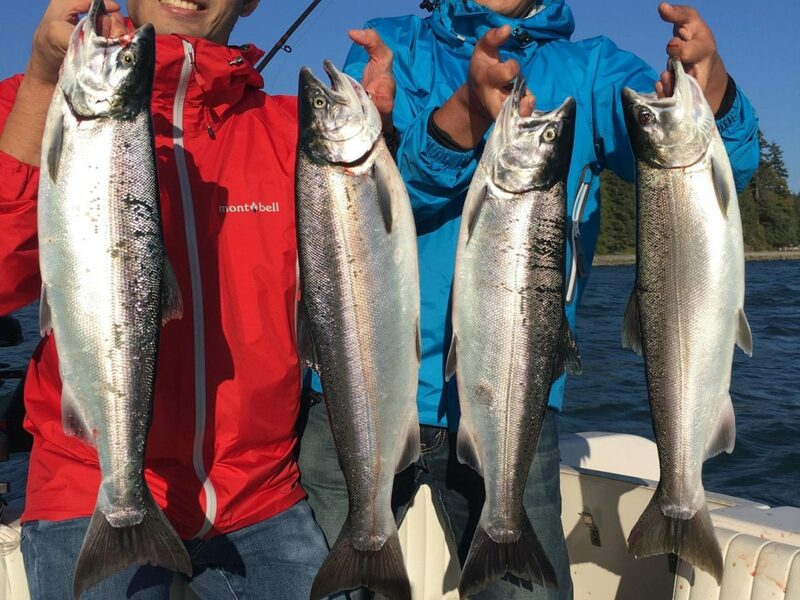 So enjoy your sockeye fishing this weekend and then we will see how the South Arm is for chinook in the coming week as well as the Cap Mouth and before we know it we will be chasing winter chinook.